Maternal or ‘perinatal’ mental health has been in the spotlight recently, following the inquest into the tragic case of Charlotte Bevan. 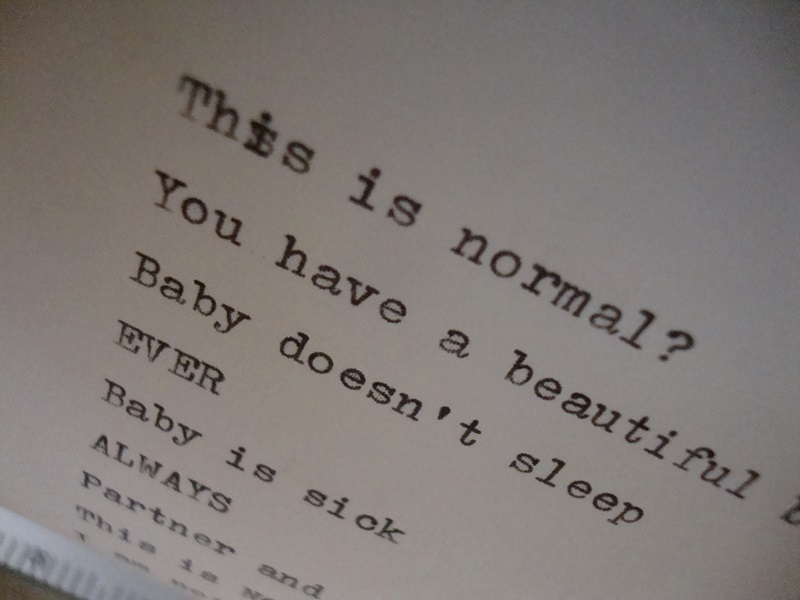 An exhibition currently on display at the Institute of Mental Health highlights the devastating effect perinatal mental illness can have on women and their families. At the heart of this exhibition however, is a celebration of what can be achieved when communities come together to support one another on the path to recovery. It’s Not The Baby Blues is a moving collaboration between local artist Debra Urbacz, photographer Paul Dale and Nottingham based peer support group Open House. Open House was founded in 2012 by two women who had both been in-patients in a specialist mother and baby unit. Sarah and Geraldine were recovering from postnatal depression and found that there was little in the way of self-help in the community. Open House has gone from strength to strength and now meet weekly, offering support to those recovering from perinatal mental illness. They also aim to raise awareness of this condition and have recently secured a grant from Nottinghamshire County Council. It’s Not the Baby Blues features women who have used Open House following a period of perinatal mental illness. 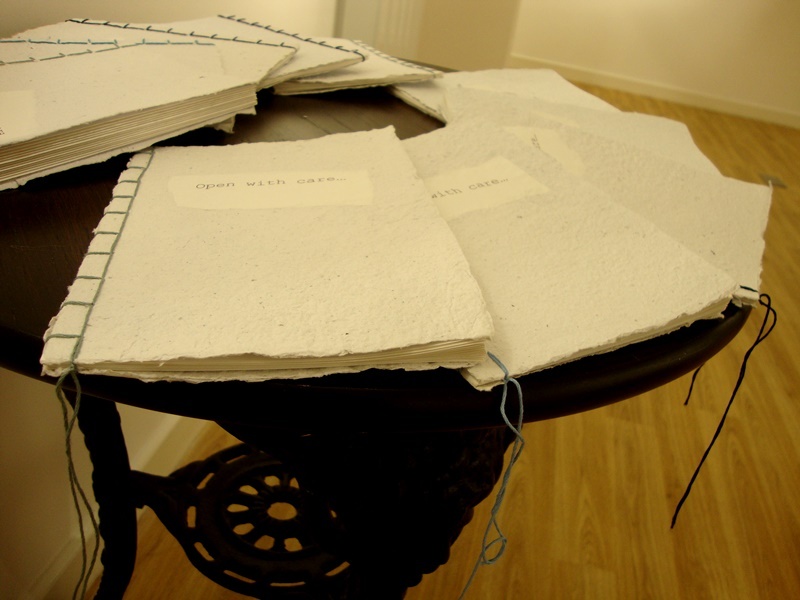 Their stories are told through beautiful photographs and delicately typewritten extracts of their personal illness narratives. 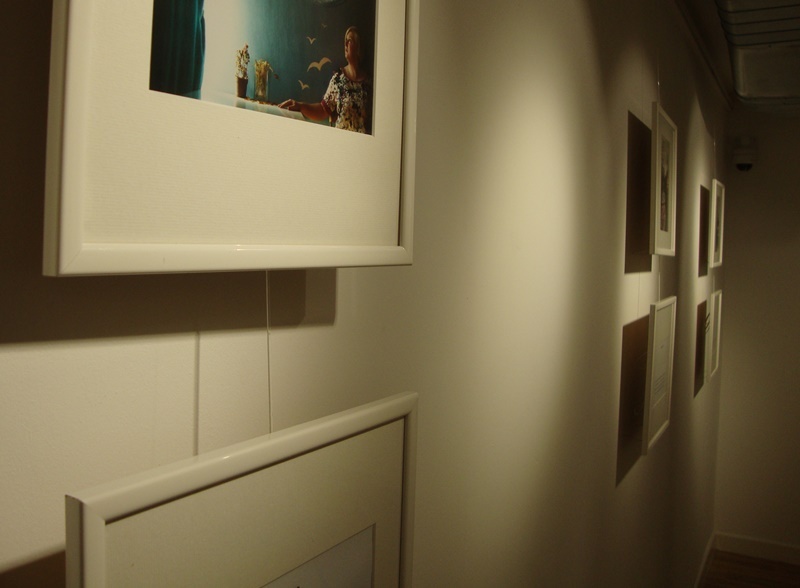 The idea for the exhibition emerged from a late night conversation between Debra and Geraldine, following the tragic death of actor, Robin Williams. Concerned by what she saw on social media in the days that followed, Geraldine was keen to do something positive to raise awareness of mental illness and suicide. “I decided to work with the words they spoke and the stories they told me. We would chat for up to an hour before deciding on a space, usually in their home, and the props we would use to portray a moment in time when they were either at their lowest, or in the place where they felt safe. Paul went on to say how grateful he is at having the opportunity to help raise awareness of this area of mental health. Once she saw how powerful the images were, Debra felt that it was important to give each woman the opportunity to share their personal illness narratives. “There’s a huge stigma attached to post and antenatal depression. The media trend a stereotypical “yummy mummy” who can multitask with a huge smile, breast feed and have no red eyes or bags under her eyes; a mum who knows instantly what her baby needs or desires and doesn’t crumble or curl up due to the pain of hearing her crying baby. When you expect to feel happy and all you feel is numb or anxiety it can be very hard to understand yourself never mind tell someone else. Sarah Brumpton, Open House co-founder describes being ‘blown away’ when she finally saw the exhibition, first shown at the Maltcross in Nottingham. If you’ve been affected by the issues raised in this article, or would like to learn more about perinatal mental health, click here to go to the Open House information and support page.